Ramblings about my stitching life and my life in general! 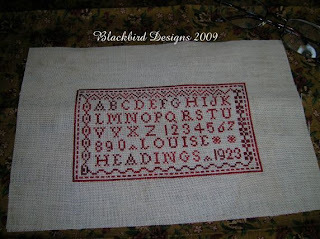 Here is my version of the Freebie from Blackbird Designs....I used 36 ct Lt. Expresso fabric, Vikki Clayton silks, and my Mother's name and birthdate. I am really happy with this little sampler, although not with my awful picture...sorry it's so dark. Thanks for looking! 60 year old retired from career but working at a less stressful job to survive. Wonderful husband of 38 years, 2 beautiful adult daughters and two amazing granddaughters! Can't forget my great son-in-law either! Love to cross-stitch but never enough time!